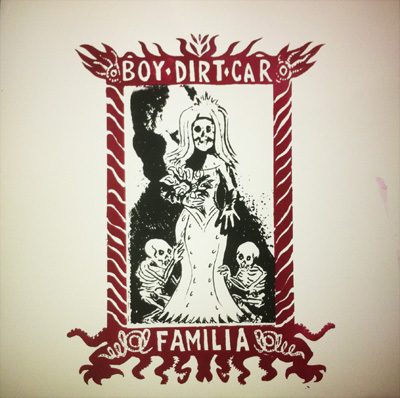 Sound collage, spoken samples, field recordings, experimental noise, and guitar noodling are what Boy Dirt Car seem to specialize in with Familia which proves to be an enigmatic effort that – even after repeated listens – I cannot seem to yet solve. There is more then one instance where intense spoken samples come to the forefront to spout monologues of profound outbursts and it feels that this is where the strong point of Boy Dirt Car is focused. Some of the samples take away from the overall atmosphere a bit though, the worst offender being the cell-phone transmitter sounds at the start of Side B, but I do have to admit it tricked me a few times and took me out of the realm of sound only to be sucked back in when I realized it was baked into the vinyl and not my roommate trying to make a call. The samples, sounds, and noise change so quickly that there isn’t much to grab onto in Familia and it becomes somewhat of a blur after 5 minutes. The production represents the lo-fi sounds quite clearly and brings to the forefront that there is some kind of a more proper “band” back there somewhere behind the overwhelming noisy samples. This could be compared to the sounds of Einstürzende Neubauten but much more focused on the tape hiss, amp noise, and other sounds surrounding the production of a band recording rather then actually using their instruments up front. Familia is still a record I am struggling to make sense of and I have to admit the jury is still out. I am intrigued and interested in half of the material here and the other half seems to be this playful experimental trash recordings which just doesn’t quite do it for me. I enjoy the samples but a lot of the instrumental noodling just feels like filler to me. Either way, it’s an interesting and unique record that should appeal to fans of lo-fi audio collage and general insanity.